THIS is what it all comes down to! Giant Little Lulu Halloween comics! Back when I was a kid, I'd never fail to reread those three comics every October in the days leading up to Halloween. Later on, after I curtailed the practice of dressing up in funny clothes and going door to door, begging for sweets--after the ninth grade, I think--I still made a point of pouring over those comics, sometimes on the very day itself, only hours before the little kiddies came a' knocking on our door. Like the Dennis the Menace Christmas specials, these Little Lulu giants evoke a very unique resonance, vividly calling back to my childhood days, something only a handful of other books in my vast collection of slowly decaying pulp-paper periodicals can manage. To me, there books ARE Halloween, partially because I made them that way by hoisting a tradition around them. No, I no longer read them every Spook Season--the life of an adult finds time to be at a premium, unfortunately--but more often than not, I DO pull them out, page through them, and maybe read a story or two come each October. Y'see, the OTHER reason I'm so fond of these books is simply because they're so doggone GOOD!! 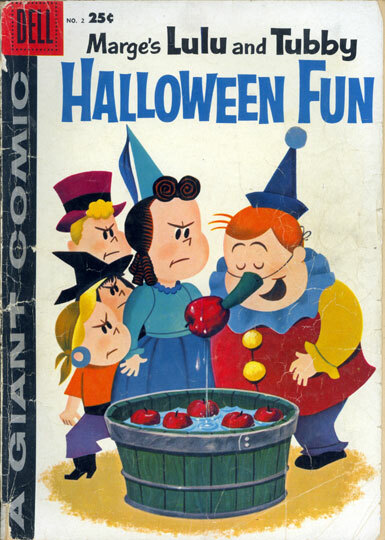 I was very happy years ago when Another Rainbow published their LITTLE LULU LIBRARIES, and I'm delighted that Dark Horse is currently issuing these wonderful comics at a more more accessible (i.e., cheaper) price, but I just wish they'd get around to reprinting Lulu's Halloween specials. Today's audience shouldn't be denied the pleasure of witnessing Mr. McNabbem dressed up as The Pied Piper, Lulu's dad daring to ring Mr. Grump's doorbell while wearing a ghost outfit, Wilbur hosting Mysto the Magician at his gala Halloween party, and Lulu hastily divesting all her dollies of their false faces after having a particularly bad dream about them running rampant on the streets when everyone else was finally in for the night! Yeah, friends, THAT' S Halloween! What? You don't think that's a moment of pure horror? There they are, right smack dab between Lon Chaney as the Phantom of the Opera, and someone wearing a modified Batman mask (and smiling maybe a little too broadly!). 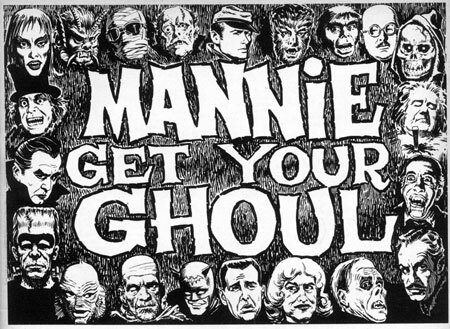 That title logo is from the fondly recalled Broadway musical parody, "Mannie Get Your Ghoul", written by Frank Jacobs and illustrated by Rickard from the 85th issue of MAD magazine (March 1964). Utilizing all the classic Universal creatures, this 8 page feature lovingly satirized the theater's then recent penchant for building musicals around the likes of such unsavory characters as thieves, ("Oliver"), gangsters and gamblers ("Guys and Dolls"), juvenile delinquents ("West Side Story"), and even--shudder-- business executives ("How To Succeed.In Business Without Really Trying")! So, the folks at MAD figured, what's the NEXT logical progression regarding musical subject matter? The timing was perfect for me, as I was at the very peak of my interest in macabre movie stars when this issue came out--AND it was one of my very MADs as well, meaning it was one of of the best ones, since (to me at least), all the jokes seemed completely fresh!! 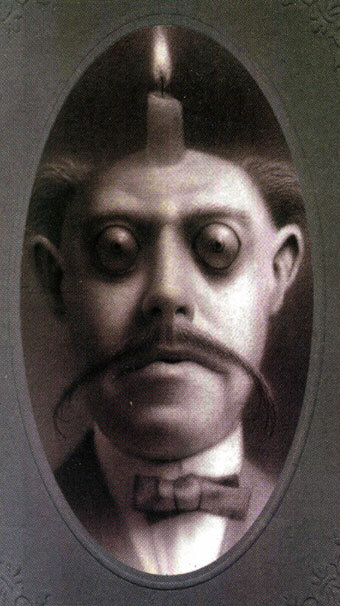 This faux-Victorian portrait is the product of the delightfully twisted imagination of artist Travis Louie. I saw Travis a few nights back at a party thrown by mutual friend Cindy Dill (several other notables, including Terry "King of the Chili-Makers" Austin, and Jim "Elan" Starlin, were also in attendance). His work is unique, and amazingly polished. Check his site out for more new stuff--it's just the thing to keep you in a Halloweenish mood all year around! Now, a short Halloween oriented personal anecdote. "If Julie doesn't go to school tomorrow, but she feels up to it, do you think we can still go to the Haunted House anyway?" "I suppose. Did Julie send you here in to ask me that?" Lynn just laughed and shook her head. Luckily, Julie didn't need much convincing--and sure enough, while she indeed stayed home from school that day, we also went to the IBM Haunted House, which was quite nicely done this year. Hey, I'm a fella who likes his traditions, especially when it comes to Halloween. I've been banished from the Trick or Treating trail since last going out in 2001--a guy's gotta have SOMETHING to look forward too this time of year, y'know! Speaking of traditions, check out Five For Friday #53, this time dealing with Halloween costumes. My first three answers were utilized in that sadly missed tradition that was the once-annual Wrightson Halloween Party. I also attended in a white sheet with my face covered entirely with green make-up one other time, apropos of nothing, actually. Lastly, Happy Boo-day, Batton Lash! May your cake be baked with candy corn filling! 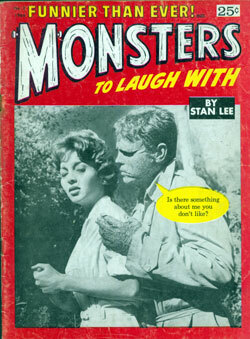 But as much as I loved Stan--AND his gags, AND monsters, to boot--I had a hard time justifying spending that quarter on MONSTERS TO LAUGH WITH, since, being just a kid, money was tight and I had to spend what I had wisely. Twenty-five cents, after all, could get me TWO Marvel Comics AND a piece of Bazooka bubblegum. Even at a leisurely pace the first time through, the 36 pages of Lee's horror yock-fest probably took me, oh, two minutes to read! 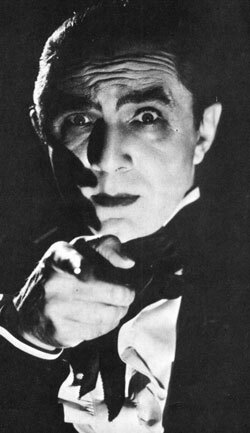 Maybe three, if I spared a moment to gaze deeply into Bela Lugosi's eyes (always a possibility). Those Bazooka Joe comic strips that came with my gum took almost as long to read, fer gosh sakes! Ultimately, I wound up with three issues (numbers 2, 4 and 5). With all apologies to the great and marvelous Stan, I'm liking contest winner Frank Waitt, Jr.s quip quite a bit better: "She had a figure about like this!" 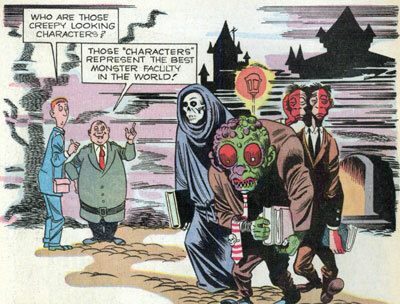 Nearly a decade later, during Marvel's monster craze of the seventies, Stan brought back this feature--and many of the same jokes--in the pages of not one, but TWO magazines: MONSTERS OF THE MOVIES and MONSTER MADNESS, the latter of which was given over almost entirely to Stan's gags. I own two issues of the former, one of the latter, and it only takes a cursory glance to realize that Stan had some, ah, long-time favorites. For instance, he seemed to have an inordinate fondness for stills featuring monsters carrying off fair damsels, with the joke usually going something like this "Cool it honey! My parents don't believe in mixed marriages!". THAT one turned up several times, with only minor variations. Contemporary commercial slogans and pop culture references always made for easy laughs as well. And speaking of Marvel Legends, word came in the other day from Jim Salicrup of a Mothman sighting--on the inside front cover of Warren's EERIE #38 (Feb. 1972)! 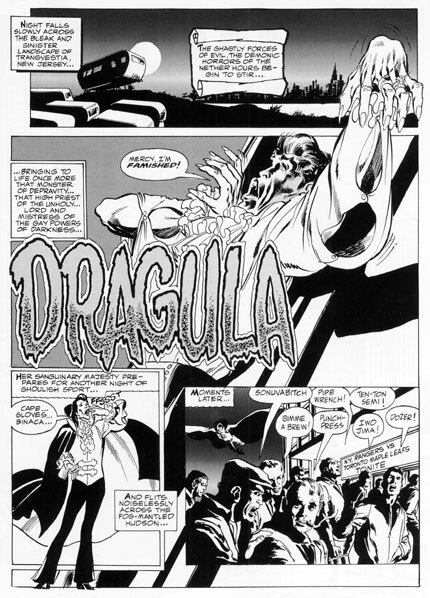 The big fella was apparently the subject of that issue's Eerie’s Monster Gallery: The Mothman Of West Virginia (by Doug Moench and Jaime Brocal). Jim didn't have his issue at hand, but thought if I might, it would make a nifty addition to this month's Fearful Fred Sez Fright-fest. Well, as usual, Jim had a swell notion, but after going downstairs to check my collection of Warren publications, I was disappointed to discover that, after bailing out on the title when Archie Goodwin left his editorial post somewhere in the publication's teen-numbered issues, I didn't start buying it regularly again until...number 39. As Don Adams used to say, missed it by THAT much!! So alas, Jim, no Warren Mothman. But if anyone has easy access to that particular issue, and can send along a nice scan, it'd be much appreciated. Cousin Eerie and the Mothman on the same page--the mild boggles, if only mildly. Here's an odd little book, one I'd completely forgotten I had bought back when it first came out until the other night when I was moving things around downstairs because of (say it with me, gang) last week's flooding. 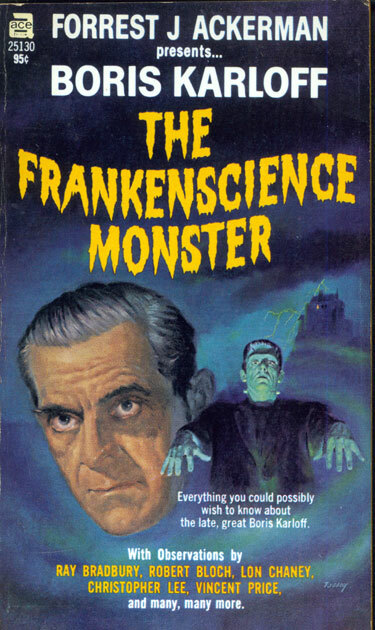 Famed monster-maven, Forrest J. Ackerman, presides over a compendium of articles and observations--some new, some old--about the then recently departed Boris Karloff (this standard paperback edition was published in 1969, the same year the 81 year old actor passed away). There are 36 separate pieces found behind Verne Tassey's cover painting in the volume's slim 191 pages, from an array (if not a wide one) of authors. Forry himself writes several eulogies for the late horror icon, including ones for SCIENCE FICTION TIMES, one for a noted fanzine of the era, PHOTON, and one written on spec within 24 hours of Karloff's death for the LA TIMES, but left unpublished since the newspaper already had an obituary by one of their own staff prepared. And that's just scratching the surface of this book's contents. 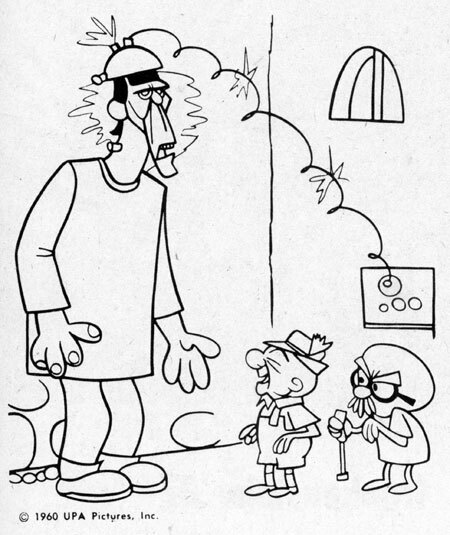 Various encounters with the screen legend are shared by a number of different folks, background information and checklists are lovingly compiled, and the ever dependable Don Glut shows up with two separate articles, one focusing on Karloff's radio work, the other concerning Boris in the comics. Why, they even dug up--you should pardon the expression--a piece from a 1932 issue of MOVIE CLASSIC spotlighting what was then merely the first of several ex-Mrs. Karloffs! In 1948 Universal Pictures paid Karloff's hotel bill in New York City to get publicity shots of him staring curiously at the marquee of "Abbott and Costello Meet Frankenstein". He said okay--"as long as I don't have to see the movie." Of course, a year later, he shared billing with the boys in "Abbott and Costello Meet the Killer, Boris Karloff", and then again in 1953, on "Abbott and Costello Meet Dr. Jekyll and Mr. Hyde", so just who was the joke on THEN, hmm? When I started this web-site nearly three years ago, there were plenty of stories I wanted to finally tell. Well, some I have, but some I haven't. Some stories needed just that little extra dab of attention, as well as the right timing to reveal all. One such anecdote that I've been patiently keeping tucked away in my back pocket deals with that gent over to the side, the immortal Bela Lugosi. Said event happened back in the eighties (either 1984 or 1985), and I've been--you should pardon the expression--DYING to tell it ever since. Well, the time has finally arrived, and you can find this entirely true story (I swear!!) over at the IGN Comics website, in the form of the 33rd chilling episode of The Fred Hembeck Show! So please, go check this week's installment out, even if you're getting weary of our current narrow focus on all things creature features, big and small, I urge you not to pass this one by. After all, I've only been waiting twenty years or so to share this startling little story with the world! Roger Green offers a few eloquent words about the late Rosa Parks, an amazing lady who made history simply by standing up for her rights by continuing to sit down. Those of you who recall Steve Wintle's much missed Flat Earth blog will be happy to learn he's returned to the blogging arena, in the form of a communal page called The House of Irony (or go here for the strictly comics oriented portion of this wide-ranging pop blog). Nice to have you back, Steve--and I'm NOT being ironic, honest! And today? Well, as I write this (Tuesday evening), our area's suffering the remnants of Hurricane Wilma. They call it a Nor'easter in these parts. Me, I call it too much @#$%ing rain!! So far, though, so good--water has yet to start gushing in downstairs. Even if it does, we're prepared this time. But still, getting up an peeking down the steps every, oh, ten minutes, is hardly the way I'd planned to spend my day! More later. Until then, "Glub glub, y'all!" If you're not familiar with Batton's lawyer duo, well, there's good news afoot--they've just gone online with all new material, with fresh strips debuting every Monday and Thursday. Here's your link for that. "The Monster Mash" was once a very big hit, but the Monster LASH? BATTON a thousand! With one week left until Halloween arrives, Monster Month is slowly winding down on this blog. Yeah, maybe its been a little much--I promise, NO Christmas Month in December--but I've come this far, so I'm not bailing now! Today's entry serves as a bit of a preview for NEXT month's (unofficial) theme, Stuff I Found Downstairs Cleaning Up After The Big Flood. Oddball newspaper clippings, long-forgotten comics ephemera, idiosyncratic drawings--if it ain't wet, it's fair game! I could be wrong, but I don't think this was ever published anywhere. There's maybe a dozen pieces of art combining my pencilling with wife Lynn's inking, done during a period back in the early eighties when she had way too much time on her hands. She did a nice job, I thought. More from THAT particular well in November. In the meantime, more creepy creatures tomorrow. Just bear with me here, okay? By the way, both of those covers were drawn by the wonderfully talented Kurt Schaffenberger, who was NOT the lollipop loving lump's regular artist. That claim to cult-hood could be made only by Ogden Whitney, who, aside from a handful of covers turned in by Mr. S, was otherwise responsible for every appearance young Mr. Popnecker made in various ACG Comics publications during the sixties. 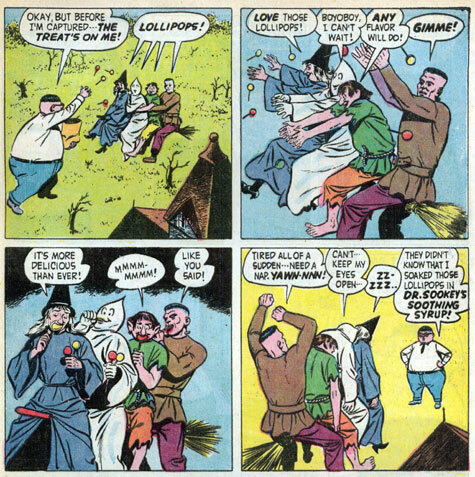 Like, for instance, this sequence from "Herbie And The Spirits", the rotund one's second appearance, originally found in FORBIDDEN WORLDS #94 (March-April 1961). 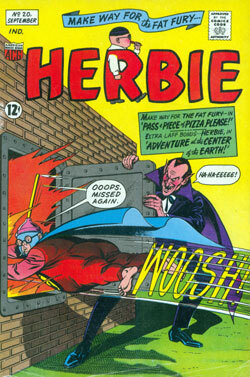 Like I said, there's no explaining Herbie. And clearly, that accounts for a huge portion of his sometimes otherwise baffling charm. 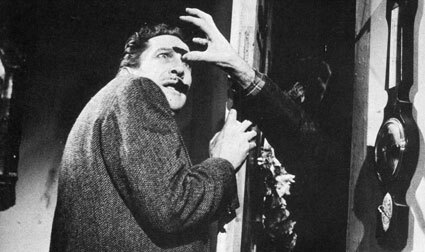 That's the key portion of a full page photo from "The Last Man On Earth"--a then current Vincent Price flick--which appeared on page four of the very first regular issue of FAMOUS MONSTERS OF FILMLAND that I ever bought, number 30 (September 1964). I don't think I ever saw another still from that film anywhere else after that, but no matter--THIS terror inducing tableau was forevermore burned into the ol' cerebellum. Finally, the other night, I sat down and watched the movie. It wasn't bad. But, the picture above turned out to be more than a little deceiving. Look, I'm not gonna go through the whole plot with you--this isn't a review, y'see. Suffice it to say that our friend Vince there is the last functioning human alive (or so he thinks), three years after a mysterious plague turns everyone else into vampires (who actually act more in the tradition we've come to associate with zombies, however). It's based on a famous novel, "I Am Legend" by Richard Matheson (which I've never read), which spawned a later version, "The Omega Man" with Charlton Heston (which I've also never seen), and there's even been recent ongoing plans to film the story a third time under its own name utilizing big stars and a much bigger budget (which I probably won't go out and see, either--sorry). But in this version, it's all very matter of fact for the surviving Price--he gets up out of bed each morning, and, protected by the sun's rays, goes out about the city and almost casually stakes as many sleeping vampires as possible before returning home to barricade himself in as, woken by the darkness, his undead neighbors pound his door for hours on end. As these creatures are portrayed as both slow-moving and stupid, he's never in much danger once he's inside (though how he gets ANY sleep whatsoever, I'll never know), but the moment captured above is one of two instances in the film where he actually loses his cool: having to fight his way back into his house after losing track of time and returning home during the dark of night (the other is during a flashback when he's confronted by his recently dead wife banging at his front door. You know THAT can't be good...). It's a strong story--I can see why folks want to keep remaking it--but this version was made with an otherwise (save for Price) Italian cast and crew, with a budget that was probably less than what Pavarotti spends on pasta alone in a month--even February! Cheap, cheap, cheap! The vampires aren't all that menacing--watching the movie, I'm thinking, "Yeah, I could probably get away from those suckers myself." And logic kinda goes out the window towards the end when other survivors seemingly turn up (as in, WHY'D they wait three years to let on to Vinnie that they were out there as well? ), but Price's acting--which is NOT the typical scene-chewing you might well expect from him--is admirably low-key, fitting in nicely with the subdued, depressing mood of the production. After all these years, I'm glad I finally saw "The Last Man On Earth", but the blood-curdling bursts of terror implied by the photo above never really materialize. Initially, I was reluctant to dive into the whole monster thing. I'll admit it--I was easily frightened as a child (as opposed to, ahem, now). I put off watching anything scary for a long, long time. Before I actually did break down and sit through the dullness that was "The Cape Canaveral Monsters" (see October 8th entry), I did have one earlier false start. I tuned midway through into a showing of "Abbott and Costello Meet Frankenstein", going on the not unreasonable assumption that, hey, if Bud and Lou--two of my favorite funny men--were in it, how bad could it be? 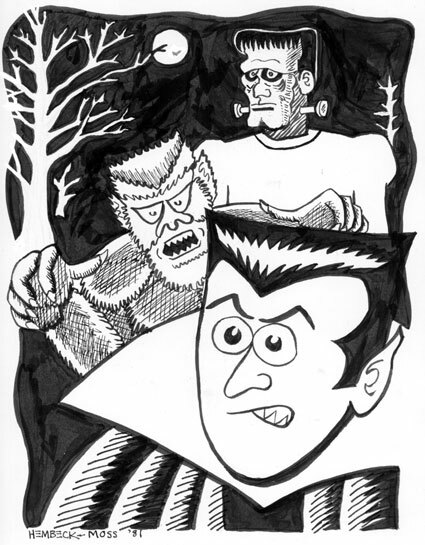 Bear in mind, I had yet to pick up my first monster mag, and had only the vaguest idea of what the infamous Frankenstein looked like. The first nefarious character I saw on my TV screen that day was Bela Lugosi as Count Dracula, but as he wasn't identified in the scene (I came in late, remember? 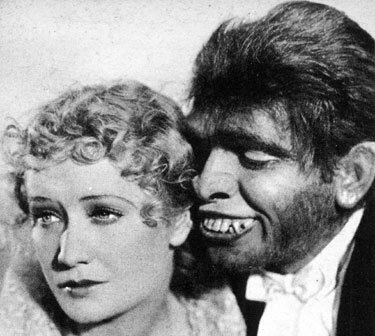 ), I clearly recall thinking to myself--in a very smug, self-satisfied manner, I hasten to add--of the elegantly dressed actor, "Well, if THIS is the supposedly horrible Frankenstein monster, I sure don't see what all the fuss is about--he ain't so scary!!" And THEN the real thing burst onto the screen, and I jumped up and quickly changed the channel! Clearly, I wasn't yet ready. 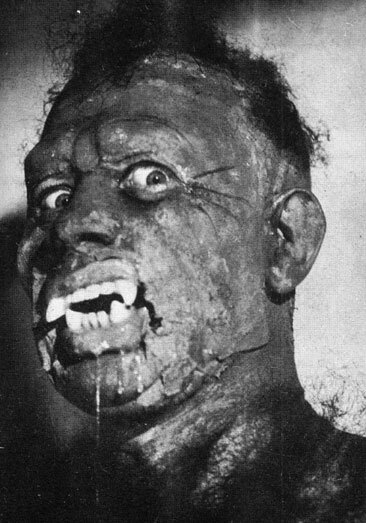 About a year later I was, and one of the ways I knew for sure that I could survive sitting through these creepy old movies without getting TOO freaked out was the fact that I could page endlessly through my issues of FAMOUS MONSTERS OF FILMLAND without having the multitude of stills within give me nightmares. Meet Harry. Occupation: grave robber. He digs people the most. From the Mexican melodrama THE BODY SNATCHERS. Yeah, I've gotta admit--ol' Harry there made me a mite uneasy at times. For quite awhile, I did my very best to avoid page 41 whenever possible--but somehow, for that very reason, I was drawn to seeking it out! Ultimately, the cornball gags in the caption diffused his grotesque appearance enough that I just laughed whenever I saw the big guy. Monsters were nasty, monsters were bad, but hey, they could be FUN too, y'know! Yes, even guys like Senor Harry! 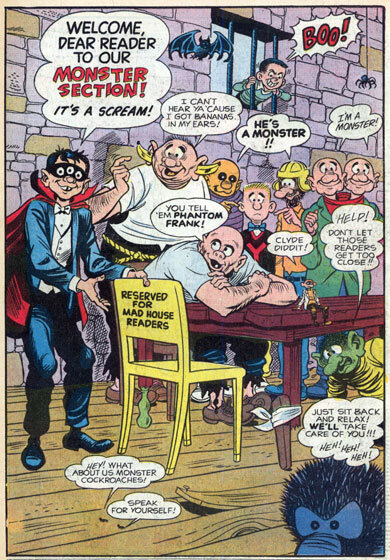 The above is just a small taste of the lead story in ARCHIE'S MADHOUSE #16 (December, 1961), "Monster Institute of Transylvania" (M.I.T.--get it?) 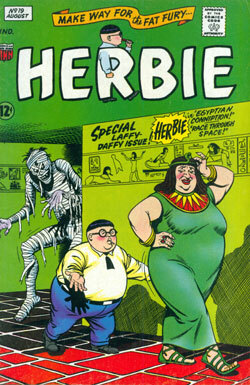 The art is by Samm Schwartz, the cartoonist long associated with illustrating the misadventures of young Mr. Andrew's associate, Jughead Jones (taking a brief leave of absence from the carrot-top spawned Goldwater empire during the mid-sixties to gamble on helping launch the Tower Comics line as both an editor and co-creator of Tippy Teen and friends. Didn't last.). For my money, Schwartz was a VASTLY underrated talent. His storytelling ability alone was enviable, but combine it with his knack for both humorous characterizations and a wonderful feel for atmosphere--as you can plainly see by glancing up top--and you've got yourself a candidate for one of the most criminally overlooked artists in the entire history of comics! Hey, it doesn't take a genius from M.I.T.--EITHER one--to see Samm was a class act! If you don't believe me, just pick up most any JUGHEAD comic from the late fifties on into the nineties, and that'll provide most all the evidence you'll ever need! Geez, will you look at the NOSE on that guy!! 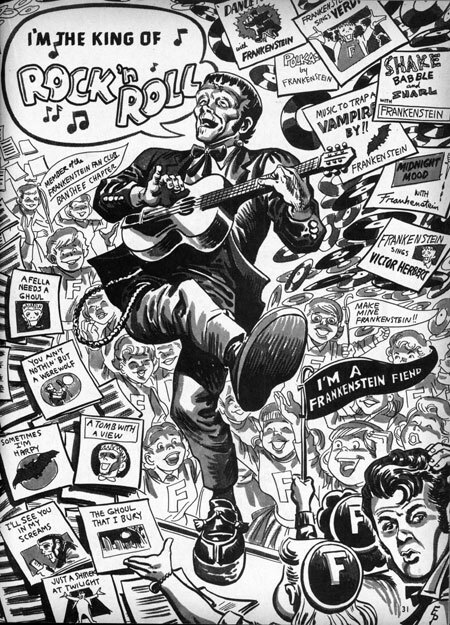 Now then, the weekly links: Peter Sanderson's Comics In Context #106, Ken Plume's FilmForce Weekend Shopping Guide, Roger Green's Ramblin' With Roger--y'know, all the usual suspects. Additionally, hats off to Mag and H for hitting the two year mark of their swell Comic Treadmill site. I don't always agree with the guys--they once said early DAREDEVIL comics weren't all that good! Can you imagine? (Actually, they made a lot of sense, but I still like 'em any way. DD comics AND the fellas both, I mean...) Keep that Treadmill running, guys--you can't stop now! Of course, Fanboy Rampage DID stop--and just when I FINALLY figured out what was going on! (I'm a bit slow at times...) Since I don't really keep up with the new books the way I once did, I didn't pay attention as much as I might've, since it was mostly people squawking about stuff I wasn't following. It's hard to get invested in an argument when you don't really know what people are arguing about, y'know? And there was always so doggone much to READ!! Message boarders do go on, don't they? Well, I only wish I'd gotten hep to it earlier and had more time to peruse it, but in any event, good luck to you Graeme--you're a legend now! They said it was a horror film. True, horrible things happen, but you know what might be a better title for this little scenario? "Dr. Jekyll and Mr. Horny"! No exaggeration. The prim and proper Jekyll moons continuously over his fiance, while her even more uptight General of a father keeps pushing the couple's wedding day as far back as possible, clearly frustrating the young doctor, who nonetheless smiles through gritted teeth as his dreams of matrimonial bliss keep getting back-burnered against his will. So instead, he front-burner's this new concoction of his, ostensibly under the guise of scientific research, but once put into effect, his transformation into the hideously hairy--and dentally deficient--Hyde is mainly used as an excuse to take total possession of a saucy blond dance hall girl who, sometime earlier, had the unfortunate luck to have had the good Dr. Jekyll help her through a scrape with an abusive boyfriend (one who ultimately--compared to Hyde--must've seemed like a real pussycat). And folks, without getting explicit in a "9 1/2 Weeks" way, the film makes it entirely clear that the lovely couple pictured above had gotten way, way past the stage of necking way, way fast! Then Hyde is found out, murders a few people, and is killed himself, reverting back to his Jekyll persona as he takes his dying breath. The end. If his name is pronounced "Gee-kell" throughout the movie, a well-known classic, why have I always heard it pronounced "Jeck-ell"? When did the change occur? In the Spencer Tracy version from the forties (which I have on tape, and hope to see sometime soon)? Or was it when Bob Stevenson's brain children met Abbott and Costello? Does anybody know--I'm genuinely curious as to when the good doc's name shifted. "By George, I always did want to meet Wilt Chamberlin!" And where's the Creature From the Black Lagoon, you might ask? I'm not certain, but I believe he was last seen swimming around in my basement!! 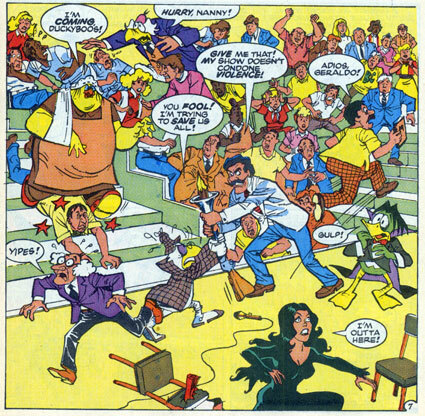 More on that later--Archie isn't the ONLY one with a Madhouse, y'know! Here's a scoop--four years before he donned the make-up to kibitz with Abbot and Costello as Frankenstein's monster, Glenn Strange first met with comic Ole Olsen, half of the "Hellzapoppin" team of Olsen and Johnson, while on the set of "The House of Frankenstein"! And here Bud and Lou probably figured THEY were the first comedy duo to hook up with ol' Frankie! ...And that's all for today! Posting will be light the next few days, thanks to the fury of Mother Nature. While nowhere near the same ballpark as the recent hurricanes, earthquakes, and tsunamis that have plagued the world, the east coast has been barraged with eight straight days of rain, and apparently the ground hereabouts was gonna take all it could take, because when I went downstairs last night a little after nine (about two hours after a previous peek) to check the few trouble spots where water has, in the past, leaked in slowly, prepared to sop it up, only to be stunned to find the ENTIRE floor covered with at least an inch of water--and rising!! This has NEVER come close to happening in the nine years we've lived here, but you know what they say about there always being a first time, don't you? More details to follow--yes, there were casualties, so to speak--but suffice to say, I stayed up all night, bailing things out as best I could, until Lynn was able to go out this morning and buy several pumps, each more effective than the smallish one we had available to us (which we use exclusively to pump the water off our pool cover in the spring, a task that generally isn't in need of any real speed, unlike last night's situation). A massive clean-up awaits me--aw, @#$%!.. Anyway, it's eleven thirty in the morning now, the pumps are working, and I'll probably hit the sack soon. But first, a post. Back in the late fifties and early sixties, most adults considered the renewed interest in horror movies--particularly those featuring the iconic Universal Studios creatures--to be merely a teen-age fad. EVERYONE considered that a fad! 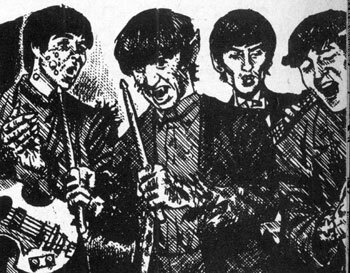 Yup, that's John, Paul, George , and Igor, courtesy of perennial CRACKED artist, John Severin. And anybody out there remember early sixties crooner Bobby Vee? Ever wonder what "Vee" stood for? Well, no doubt, some scribe for the likes of SICK was cobbling together a "Bobby Vampire" script even as the Beatles broke big in 1964, forcing him to trash his work, From then on, it was all, "I Want To Bite Your Neck", "I Saw Her Stabbing There", "Love Me Boo", "Twist And Howl", and "P.S. I Love Voodoo". I've sent mine in, and if you hurry, you can get your choices on the record as well. Come back here tomorrow, click the above link, and read the results! Although he never appeared as a guest on "The Tonight Show", I'll always associate the Mothman with Johnny Carson. I bought a supermarket tabloid. "Johnny Carson--Laziest Man In Show Business!" Over the years, the public eventually got used to the late-night host's frequent vacations and regular three day weeks, but this was all fairly new stuff back in '75, and THE STAR felt the need to rile up some outrage amongst the populace. I myself wasn't watching Johnny at the time--I never was much of a Carson follower--but I was intrigued enough by the aggressive rudeness of this screaming headline to plunk down a quarter to see what sort of case the paper was going to make against the ersatz Carnac (non-Inhuman division). Nowadays, that sort of brash tabloid celebrity coverage is all too commonplace, but back in that Bicentennial Year Minus One, it was enough of a novelty to catch my not-yet-jaded attention. So sue me. A two page article on the Mothman. "The Mothman?" some of you may well be asking, "WHO is this Mothman you speak of?" Well, it's a long story, and in a measly two pages, THE STAR only barely scraped the surface (I recall that they focused heavily on some mysterious strangers dressed all in black--I think they referred to them as "The Enforcers", bringing back warm (but totally unrelated) memories of AMAZING SPIDER-MAN #10--who'd show up after a sighting of the creature, ask questions, and then quickly vanish again). All of the details, it was noted, could be found in a book that was about to be published entitled "The Mothman Prophecies", written by noted UFO expert, John Keel. I HAD to have a copy! But, try as I might, I couldn't find one. 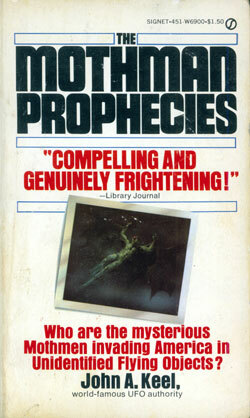 None of the local campus area bookstores chose to stock the hardcover edition of something with the curious title of "The Mothman Prophecies" (go figure). Frustrated, all I had was the slim set of facts found in the two-page article--and the constant mocking, good natured though it may've been, of those around me, none of whom bought into this thing anywhere near the way I did. But one day early in the spring of 1976, in one of those selfsame bookstores, I came across the first paperback edition of this by now (in my mind, anyway) nigh legendary tome! I was ecstatic! Grabbing a copy, I hurried home, brandished my prize before all my pals, did my best to ignore their collective eye-rolling, went to my room, and settled in with the book. And WHAT I learned! Oh me, oh my! The Mothman--a huge, seven foot winged creature with red eyes--had been spotted on several occasions in the small town of Point Pleasent, West Virginia, during the mid-sixties, and tragedy and disaster always seemed to follow, the worst instance being the collapse of a bridge, responsible for the deaths of nearly fifty people! The blurb on the front cover says "Compelling and genuinely frightening! ", and it was true--I couldn't stop reading, AND I was getting totally creeped out! I can still recall being up in my room, late at night, when everyone else in the house was asleep, one eye on the latter pages of the book, the other peeking towards the window, blinds drawn, but half expecting the glow of red eyes to be staring into my second floor room! Despite my enthusiasm for this undeniably true, thoroughly documented story, nobody else took me up on my offer to read the book. Dear Lynn most especially would have none of it. To her, the Tooth Fairy and the Mothman possessed roughly the same degree of credibility--with maybe a shade more favoring the Tooth Fairy because, after all, hey, she DID make a few bucks off of him! (Her? IT?...) But I believed, yes I did! The Mothman existed! And so, by extension, did UFOs (they were part of the story too, y'see...). Now, this could've been one of those watershed events in a person's life. I easily could've gone out and bought up every other book this John Keel fellow had written--and he had a pretty hefty bibliography behind him, make no mistake--turning myself into a full fledged UFOlogist. This all came to mind the other day when I saw Dorian Wright had devoted an entire entry of his blog, postmodernbarney.com, to the Mothman (including a fine array of associated links). Of course, Dorian dismisses the whole thing as "bunk', but y'know, even after all these years, I'm not so sure. After all, THE STAR was right about Johnny, weren't they? I mean, he couldn't even hang in there long enough to make it exactly thirty years hosting "The Tonight Show", could he? Now, c'mon--that IS lazy! So yeah, winged creatures flying over Point Pleasent? Sounds perfectly reasonable to me. Now if you'll excuse me, I have to go help the finance minister of some small country who needs my assistance getting to his nation's wealth. Boy, I sure am lucky he emailed ME--I stand to make quite a few bucks out of the deal! At least, that's what he tells me. What is the Secret Origin of Richard Corben? Zip on over to the 31st episode of The Fred Hembeck Show to find out! While over at the IGN Comics website, check out Peter Sanderson's Comics In Context #105. Peter takes an in-depth look at Neil Gaiman's new prose novel "Anansi Boys". Mark Evanier has a touching story about the late Louis Nye. Roger Green wasn't John Lennon, but he played him in front of the family record player; and more. BookSteve's Library is going all creepy, scary, monster-centric, too. Dial B For Blog continues their ongoing Halloween celebration with the Frankenstein Monster, the Headless Horseman, and Devils and Demons. Well, to me, the vexed vampire in Elaine Gignilliat's cover painting for the June, 1981 issue of NATIONAL LAMPOON always looked hauntingly like...Charlie Callas? Okay, that's probably just me. I'll admit, I never really found many of the comic strips published in the LAMPOON all that funny--and this Tony Hendra written episode is no exception--but 1971 era Adams artwork is always a treat to behold. Even better, believe it or not, is the full-color cover by none other than Frank Frazetta that accompanied this nine-pager (one that, by the by, to my mind made a better case for this concept's glaringly obvious gag than the comparatively labored.strip ever did). Shh--don't let anyone else know. After all, I wouldn't want to give other folks any sorts of ideas, because then, next thing you know, EVERYBODY will be posting nekkid pictures, and, gee whiz, what would become of the web THEN?? If nothing else, posting Dragula allows for an easy transition over to a fascinating set of links I stumbled across just the other day. Looking at "Bride Of Frankenstein" through a gay prism, for instance. 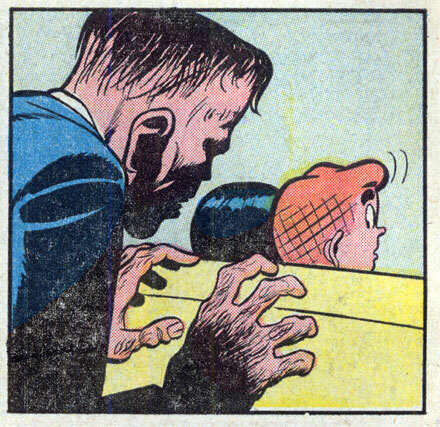 Or howabout a similar peek at "Freaks"? The entire classic Universal output? "Plan 9 from Outer Space"? These are all segments found at the Bright Lights Film Journal site (which trumpets a piece on the wondrous "SpongeBob Squarepants Movie" on its home page no less!). This is all very intriguing stuff, and I recommend that those of you interested in gaining a fresh perspective on some old favorites take a look. And if nothing else, it got me thinking--I've already seen "Ed Wood", but I really should see "Gods And Monsters" too, shouldn't I? 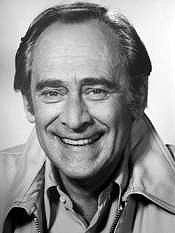 I was saddened to read of Louis Nye's passing at age 92. Growing up in the years just past Steve Allen's original heyday, I still managed to take delight in any latter day antics of Allen and his crew--Tom Poston, Don Knotts, Pat Harrington, and most especially Louis (pronounced "Louie") Nye. He ALWAYS made me laugh! In recent years, I was genuinely thrilled to see him take a recurring role on "Curb Your Enthusiasm". Approaching ninety, Nye still possessed the innate ability to deliver a laugh line for all it was worth--and sometimes, all he really needed was a casual look to crack me up. It's unfortunate that he's gone, but I'm grateful to Larry David's gang for letting a seasoned pro go out working, and at an age well past that when most actors had long since retired (whether by choice or not). Famous for greeting his old boss with the line "Hi-ho Steverino", as much as I would've liked to end this small but sincere tribute with a play on that phrase, neither his first or last name really fit. And making a play on "The end is nigh" just seems too, well, disrespectful. So let me just say simply that Louis Nye brought me a lot of chuckles, giggles, and guffaws over the years, and that he'll be long remembered but sorely missed. 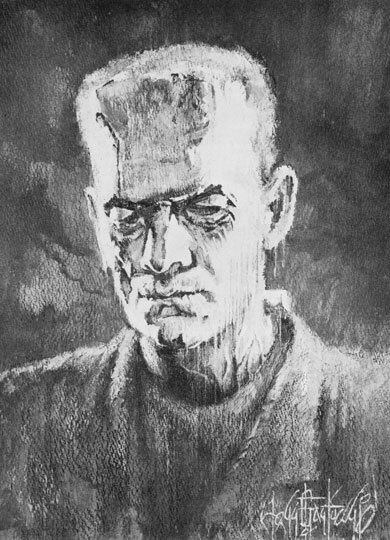 This painting by John Fantucchio graced the cover of 64th issue of the noted sixties fanzine, RB-CC, and remains, to this day, one of my all-time favorite interpretations of the Frankenstein Monster. (I've long wondered whatever became of John Fantucchio. His unique artwork seemingly turned up in just about every other fan-publication coming out of G.B. Love's S.F.C.A. corral back then, but aside from a few fleeting strips found in the post-Archie Goodwin Warren magazines shortly thereafter, one day he just sort of...up and vanished. 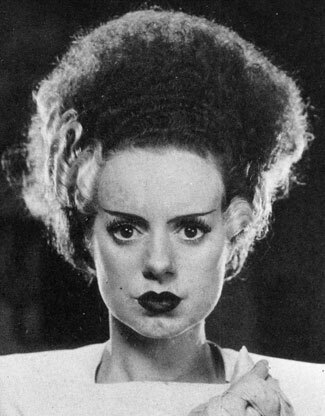 There she is--no, NOT Miss America--the title character of what a lot of folks (myself included) consider the greatest monster movie of all time--or at least from the classic era-- "The Bride Of Frankenstein". 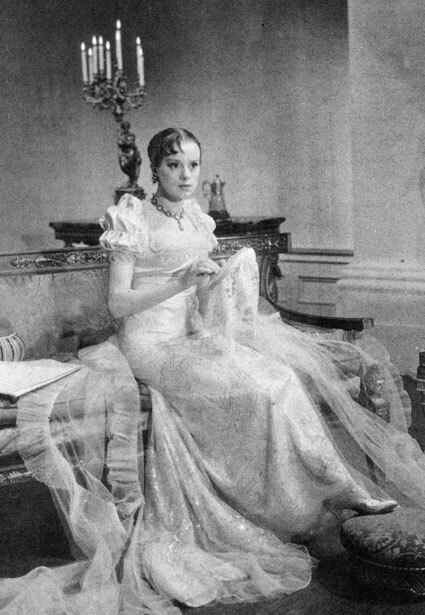 Given the relatively small amount of screen time allotted this stitched-together sweetie, it's a tribute to both actress Elsa Lanchester thespian abilities and Jack Pierce's remarkable make-up that, over the last seventy years, the Bride's image has reached true iconic status. But what of the film's opening scene, wherein a radically different looking Elsa appears in the introductory role of Mary Wollstonecraft Shelly, the woman who, way back around 1818, wrote the original novel that would later spawn a spate of Frankenstein flicks? When, I wonder, was the last time you saw HER? What a cutie! Hubby Chuck Laughton was one lucky stud-puppy, that's for sure! (Best then not to think of the aging actresses' many appearances on sixties TV, in both sitcoms and hour-long dramas, cast as a frumpy and generally ditzy little old lady--better to remember her as the woman who both made the Frankenstein monster what he is today, AND then transformed into a mate to, well, DIE for! (Hope I didn't just spoil the ending of the movie for those of you who haven't seen it yet...). Happy 65th birthday to John Lennon, which is TODAY, not yesterday as I mistakenly indicated in my last post. When I was younger, I made a point of avoiding scary stuff. Sometimes it blindsided me--like unexpectedly, during an episode of "Car 54"--but generally, I managed to steer clear of shudder-inducing cinema. I WAS getting older, though, and I began to think maybe I was missing out on something here, something all my buddies would invariably chatter excitedly about at school. So I distinctly recall the day I made the decision to go ahead and make the plunge into the realm of macabre movies. It was a Saturday afternoon. I was at my grandmother's house, watching TV. A commercial came on. It for that evening's edition of Channel 11 WPIX's weekly "Chiller Theater" selection. As I sat there in front of the screen, mesmerized, I first saw a hand come up out of the ground, then a vampire throw back his cloak, a shapely but pale woman walk zombie-like alongside a hefty--and threatening looking--bald man, an enormous squid-like creature come out of the ocean, and an electrified man rip off his restraints and grab for his captors throats! At the end of this amazing display, the off-screen announcer gravely intoned, "Tonight at 7:30 on "Chiller Theater", "The Cape Canaveral Monsters"! Don't miss it!!" Miss it? After THAT promo? Highly unlikely! What better way to inaugurate myself into the world of man-made killers and old world creatures than to watch THIS monstrous smorgasbord? 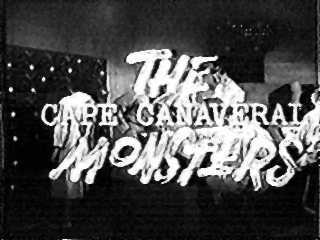 Because, y'see, I was under the impression that the commercial I'd seen earlier was composed entirely of clips from "The Cape Canaveral Monsters" (the title WAS plural, after all...). Imagine my mounting frustration, as I sat there, waiting ever-so-less patiently, as each station break would come and go, and none--not a single one--of those cool looking creepsters from the ad had yet to show up!! Sigh, They never would. As you may've probably guessed, the clips were an amalgamation from several movies, most notably "Plan 9 From Outer Space" (which works surprisingly well--just so long as you limit it to bites of no more than say, oh, five seconds at a time?..) and Lon Chaney, Jr's "The Indestructible Man", among others . Noticeably absent were any of the alleged Cape Canaveral monsters, and there was a simple explanation for that--there WEREN'T any!! Well, not in the traditional sense. A couple of aliens land on Earth and--all off-screen, mind you--take over the bodies of a man and a woman, hoping to use these human vessels to sabotage our nascent space program (this quasi-topical film was released in 1960). Outside of a slowly deteriorating skin condition, the pair hardly resembled the shambling horrific characters I'd primed myself for, and even if the movie had been any good, I would've been severely disappointed. Inasmuch as it was directed by Phil Tucker, who gave us the outrageously awful "Robot Monster"--y'know, the one with the man wearing a space helmet over his gorilla suit, working near some caves on a bubble machine to take over the Earth with? Yeah, THAT "Robot Monster"! !--I shouldn't have been surprised at how bad it was. Watching it now--or, in my twenties, like I did the aforementioned "Robot Monster"--I may've been able to actually ENJOY it for it's egregious flaws, but not at that age, not with those expectations. Uh uh. I haven't seen it since, though some of the more hazy details were filled in by this astoundingly comprehensive piece I found with some quick Googling. Y'know, the Internet truly IS an amazing place.. I don't recall what my SECOND monster movie was, but I'll never forget my first, if only for the valuable lesson it taught me about having high expectations and what to do when they're dashed: just move on. Try and try again, and who knows? You might get lucky? After the sober realization had about what I had just seen finally sunk in, I remember hoping that the NEXT episode of "Chiller Theater" would feature that creepy looking lady and the big bald guy! On a totally unrelated topic, let me just note that today would've been John Lennon's 65th birthday. Y'see, with regular butler, Smithers, on vacation, Mr. Lodge hires a fellow with the suspiciously familiar name of Franklin to fill-in around stately Lodge Manor--AND, not so coincidentally, to throw a nasty scare into his daughter's carrot-topped suitor, truly putting the teen's blood pressure to the test. Naturally, his plan backfires, and Archie ultimately winds up frightening Frankie! 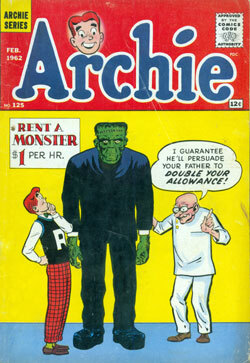 It all took place in ARCHIE #125, (February, 1962), the cover of which ALSO featured the well-known monster, though the cover-gag was totally unrelated to "Help Wanted", the lead story. What both insides and outsides did share, though, was the stupendous artwork of Harry (I love, you love, we ALL love!) Lucey! It's a fun story, made all the more effective by the under-appreciated Lucey's skillfully done illustrations. 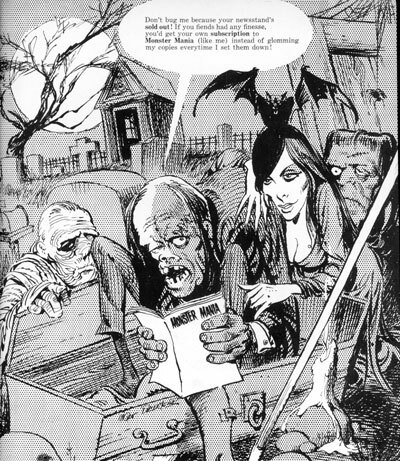 Great idea to make October the monster/horror month...but shouldn't you be observing the tradition by giving yourself an appropriate name for the occasion, in the vein (so to speak) of the EC horror comics (or their printed - or even TV host - descendants)? Something like Hembeckula, or Dead Fred....er, I expect you can think of something better, but you know what I mean! But getting back to Baden's original point, well, it seemed like a fun idea, and I considered it. Until this note from my buddy Ron Marz came in, with the accompanying link..
Ah yes, the great Hembeck! I read where he died not too long ago. That last line turned up on the DC Comics Message Boards, attributed to some guy going by the name of "stressfactor"! "Stressfactor"? HE'S not the one who just read that he DIED recently, now is he!?! And speaking of names, a lot has been made the last few days of Nicholas Cage--Actor For Hire--naming his child Kal-el. Well, I'm here to confess that had daughter Julie been a boy, we would've named HER after my favorite super-hero! Of course, since we're talking about the civilian identity of Captain America here, that's not a particularly radical act, is it? Steve Hembeck! Has a nice ring, eh? And besides the tip of the proverbial hat to Steve Rogers, it would've also been a nice salute to my favorite cartoonist, Steve Ditko, two of my favorite writers, Steve Englehart and Steve Gerber, AND a pair of much beloved comedians as well, Steve's Allen and Martin! Steve Rossi? Well, not so much--but we did dig the way it sounded. y;know? But, we had a girl, didn't we, so Julie it was (and no, we didn't name her after legendary DC comics editor Julie Schwartz. No real reason for picking the name save merely for liking it...). Click to see my choices, then add yours. 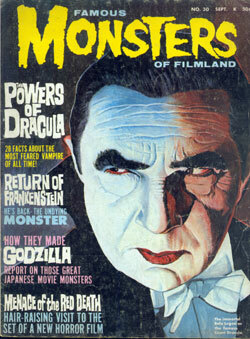 The first issue I ever bought of Forrest J.Ackerman's legendary ghoul-fest, FAMOUS MONSTERS OF FILMLAND, was number 30, September 1964 (although my first actual exposure to the concept might well've been from the first of three paperback collections, whose publication date was June of that self-same year). Whichever it was, I was instantly hooked! Take a look at that choice Russ Jones portrait of Count Lugosi--there weren't many eleven year-old boys back in the day who could've resisted THAT! 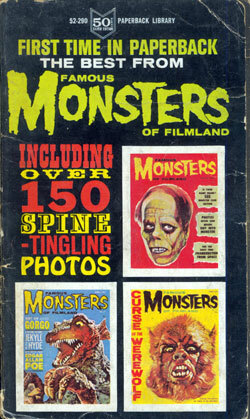 The Great Monster Craze was in full swing by 1964, and thanks to the constant availability of the classic Universal Creature Features on local television, that was the year I too became a convert. But there were a whole lotta fright flicks out there, more than any TV station could possibly handle, so, in those pre-VCR and DVD days, the best way to learn about them was to immerse oneself in the plethora of monster mags available, and where better to start than with the one that started it all, FAMOUS MONSTERS? I pulled out my collection of these Warren publications the other day, and paged through them for probably the first time in near thirty years, maybe more. I noticed a number of things. First off, I was mildly surprised to see how small my stash was: I had FM #30-40, 43, the 1966 and 1967 FEARBOOKs, the three paperbacks, and nine of ten issues of the short-lived companion magazine, MONSTER WORLD (I missed number 2, and truly regretted it--conversely, I skipped FM 41 and 42, and have no idea why I decided to pick up the 43rd issue. All I know is that it was my last...). Y'see the two books pictured here? My copies are absolutely beat up, obviously read over and over, and then over again. Looking through them again, nearly every page--every classic still, every cornball caption, even every cheesy advertisement--immediately brought back a warm wave of nostalgia. By the time I got past about the first three issues of each title, though, the warm fuzzies were gone. And by the latter issues in my snapshot of a collection--some featuring reprints of material as recent as stuff found in my initial issues!--I clearly understood, with just a cursory glance, why I abandoned FM, and never came back. Too much filler, too many pages of text saying as little as possible, and gags that, yes, even made ME cringe! Another odd thing I noticed in the my run--during that nearly two year period, a handful of elderly actors who'd received fourth, fifth, sixth--and even lower--billing on the various classic (and quasi-classic) horror films of the thirties and forties passed away, and they're all given a royal send-off! In truth, these extravagant features on the demise of some otherwise forgotten starlet who, once, long ago, fell victim to the vampire Count--or a fellow who helped excavate the Mummy's tomb, only to subsequently feel the ancient Egyptian's vise-like grip around his throat--were little more than excuses to run page after page of scenes with the dearly departed's more illustrious co-stars: Karloff, Lugosi, Carradine, Rathbone, Price, and Chaney. Curiously, a true giant of the genre--of cinema, even--also passed away during this period--Peter Lorre--but his tribute wasn't anymore extravagant than the one afforded Dracula's Van Helsing. Odd. 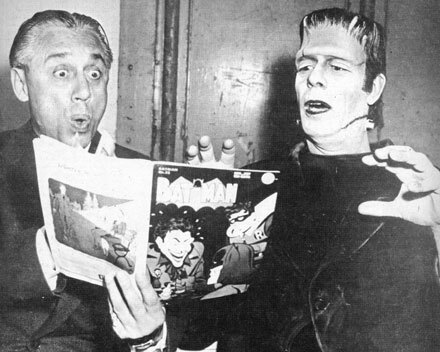 Well, I may've stopped reading FAMOUS MONSTERS relatively quickly, but that was hardly the end of my investigation into that peculiar little corner of the publishing field--but more on that another day. Check out this site for the covers of every issue. I was a bit overwhelmed--I didn't realize FM had lasted quite as long as it did. I can only imagine what it was like in its later years, since they clearly seemed to be running out of gas by issue forty. Of course, that was probably just my perception--maybe a few issues of FAMOUS MONSTERS--ANY few issues--is all you really need. After that, everything begins to seem redundant. FAMOUS MONSTERS OF FILMLAND may've, in the end, seemed a bit too juvenile for my (ahem) ever more evolving sophisticated tastes, but it WAS the original, making all the good stuff that followed possible, so let me give it the respect it's due, if only for THAT! Anyway, just HOW smart was I back in those days anyways? After all, it DID take me at least three issues to eventually realize that the mag didn't REALLY employ a writer whose name was actually "Dr. Acula"! Sorry, Forry--you sure got me there! It's that time again. Time to zap on over to this week's 30th edition of The Fred Hembeck Show. This time around, the topic--by way of answering a question my colleague, Peter Sanderson posed a fortnight back--is my relationship with the Funny Animal Kingdom. And Geraldo is the monster!! Har! Har! Some of these are just TOO easy! But aside from my little joke, there was a bit of a surprise awaiting me when I cracked open the cover to this 1989 comic--the art team. Illustrating this book-length Michael Gallagher scripted extravaganza was the unlikely team of penciller Warren Kremer--the legend behind Richie Rich, Casper, Stumbo the Giant, Little Lotta, and close to three entire decades of Harvey Comics--and inker, well, none other than the man whose art revitalized Moon Knight, painted Frank Miller's Elektra, and concocted his own set of STRAY TOASTERS, Bill Sienkiewicz!! 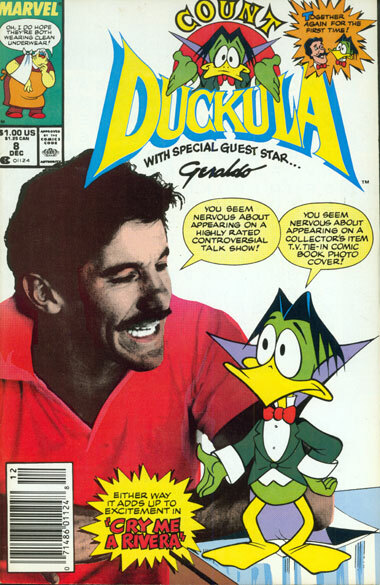 Here's a small taste of the Geraldo Rivera/Count Duckula/Warren Kremer/Bill Sienkiewicz Star Comics madness!! Getting back to my latest piece for a moment, I'd like to take this opportunity to publicly thank my editor over at IGN Comics, Ken Plume. Time was getting a little tight, so I asked Ken to help me out by choosing some images to illustrate my ramblings. In the past, I've provided him with the accompanying art, but this time around, since there weren't any specific images that needed to go along with my deathless prose--and the deadline was getting close, as I may've hinted--well, I dumped it all on good ol' Ken's shoulders! He did a great job, and I just wanted thank him! Speaking of Ken, well, just the other night, I was Googling myself--hey, we ALL do it! It's a purely natural act, y'know--and I came across THIS little blurb in what turned out to be Mr. P's Weekend Shopping Guide over at IGN FilmForce. If you're Fred Hembeck, than you're probably going to rush out to buy the double feature of the original Hayley Mills Parent Trap and its made-for-TV sequel that, amazingly enough, is titled The Parent Trap II (Walt Disney, Not Rated, DVD-$19.99 SRP). What, they couldn't go all the way and wrap it up with the final Mills Trap outing in III? What a gyp! The first disc features both films, while the second disc essentially cannibalizes the Parent Trap "Vault" release from a few years back, with behind-the-scenes featurettes and retrospectives on the original film. While I didn't exactly rush out to get my copy--I believe I managed to wait, oh, two full days--I DID buy one yesterday (AND for a mere $14.99, I might add). Thanks for the tip, Ken--I probably wouldn't have even known that the discs had been released if you hadn't directly pointed it out to me! Now, I just need to find some time to watch it--and when I do, I WON'T be Googling myself! Promise! Roger Green. Every day, this guy has something to say! Man, he's taken to blogging the way Count Duckula took to a Rivera!! It appears my whining last week won me a spot in Greg Burgas' weekly array of links, and I'm thankful for that. Still, upon sober reflection, my behavior was hardly dignified, and I assure you, Greg, it WON'T happen again. Next time, I'll just flat out beg!! Begging is SO much more sincere, don'tcha think? And, Mr. B? I realize we're Permalink free hereabouts, but the IGN material happily boasts that nifty li'l function. Just a tip, though--you'll KNOW when the begging begins, never fear!! And when it comes to links, Laura Gjovaag ALWAYS seems to have plenty--though it only SEEMS like most of 'em are Aquaman related! In much the same spirit as we're promoting here, Dial B For Blog has great entries on Aurora Monster Kit ads and Werewolves and Witches! Yup, another winner! Well, what are you waiting for--GO!! We continue on today with what has inadvertently developed into a series of promos for monster magazines, all long since left moldering in the mausoleum of petrified periodicals. 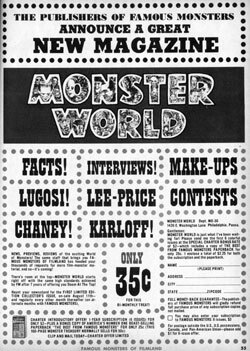 This time around, we focus on the short-lived companion to Warren Publications trailblazing FAMOUS MONSTERS OF FILMLAND, MONSTER WORLD. 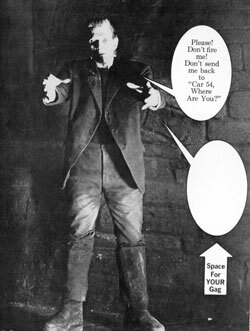 This ad appeared in the 30th issue of FM (September, 1964--just coincidentally, my initial exposure to the magazine, but more on that later this month), heralding the arrival of the lower-priced MONSTER WORLD (35 cents as opposed to the hefty fifty cents Forry Ackerman's original brainchild went for). 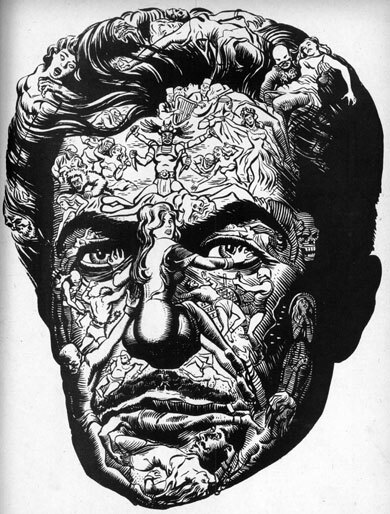 When the first issue finally hit the stands several months later, it brandished an entirely different logo than the one used in the FM ad, but I was always quite enamored with this design, mainly because the multitude of caricatures of classic horror films icons found within each letter were so nicely drawn. My first guess would be Russ Jones, but I'd have to include the great Wally Wood as a prime suspect as well. 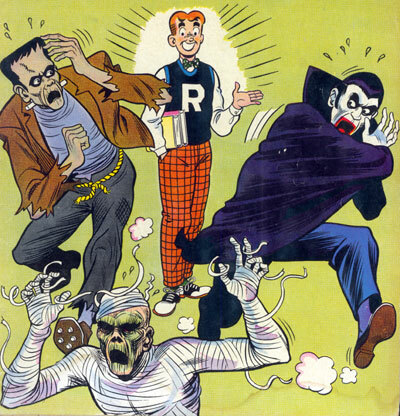 After all, the very same pair teamed up to produce a short--but richly delineated--comics adaptation of the original Universal "Mummy" film for the debut issue of MONSTER WORLD. And, unfortunately, in going over to friend Evanier's to facilitate the above link, I was confronted with the sad news of the passing of two familiar faces from my youth, Nipsey Russell and Hamilton Camp, both of whom I was always delighted to see, frequently brightening the vast video landscape. I was particularly fond of Nipsey, not only for being a part (however small) of my beloved "Car 54, Where Are You? ", but also for being a regular panelist (alongside another long-time fave, Soupy Sales) on "Can You Top This? ", whose late sixties edition doubled as both an entertaining game show and a hilarious comedy showcase. In recent years, I was pleased to see Nipsey turning up ever so occasionally as the featured attraction in some fanciful--and quick--comedy bit on Conan O' Brien's show. All due respect to Carl Sandburg, e.e. cummings, Joyce Kilmer, Allen Ginsburg, and all the rest, but MY favorite poet has always been Nipsey Russell. Yes, those other folks may well have had an edge with the words, but when it came to delivery, it was abundantly clear--Nipsey had no peer. 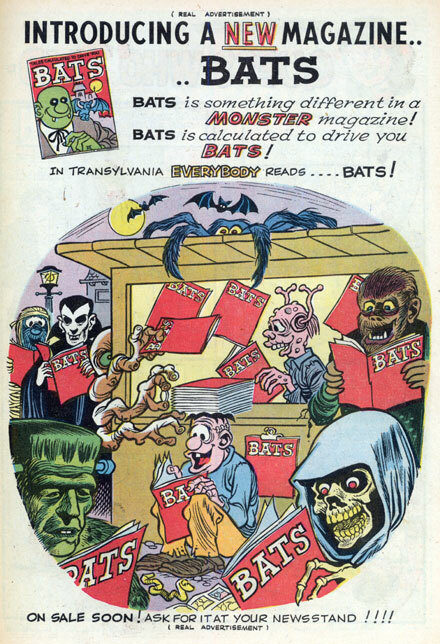 Last October, in the entry for the 23rd, I made mention of a book called, TALES CALCULATED TO DRIVE YOU BATS published by the folks at Archie Comics back in 1961 for a few short--but fiendishly fun-filled--years. Well, shortly thereafter, one of my thoughtful readers sent me a scan of the delightful house ad above that originally appeared in the 16th issue of ARCHIE'S MADHOUSE (December, 1961). Unfortunately, in the intervening year, I lost both that scan AND the name of said helpful correspondent--they were on the computer that conked out several months ago--but luckily, I myself owned a copy of that particular issue of ARCHIE'S MADHOUSE, so I knew I'd be able to at least share the nifty Orlando Busino art work with you people, even if my the gent who tipped me off must remain anonymous, at least for now (you out there, friend?...). One other thing--notice how it says "Real Advertisement" at both the top and the bottom of the page? That's probably because, in the context of the rest of the issue, it sure seems like just another goof! But it's not. It's BATS. 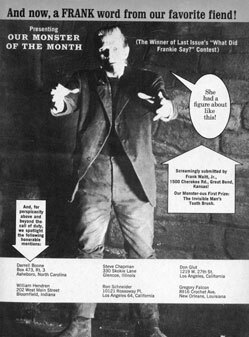 The above subscription ad (minus the coupon that ran underneath) appeared in the first of the three issues the short-lived MONSTER MANIA magazine eked out (or is that, "EEKed out"?...) 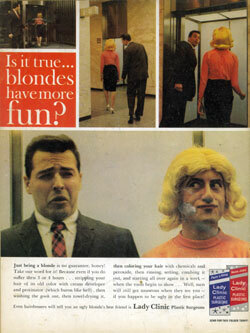 to the newsstand back in the sixties. Co-published and edited by noted Warren Publications' veteran, Russ Jones, it commenced mid-way through 1966. I thought you might like seeing MAD's maddest--and best--caricaturist, Mort Drucker, in a rare outing outside his normal environs, offering his always delightful--and in this case, truly dead on--take of the classic creepy creatures that so enamored a whole new generation of monster movie fans, of which I proudly counted myself as one at the time. (Although I bought a copy of the third and final issue--sure am glad I DIDN'T subscribe!--the pair of Christopher Lee and Peter Cushing photo covers, nice as they were, sorta paled before the Frank Frazetta painting used for the cover of the single issue I missed, MONSTER MANIA #2! 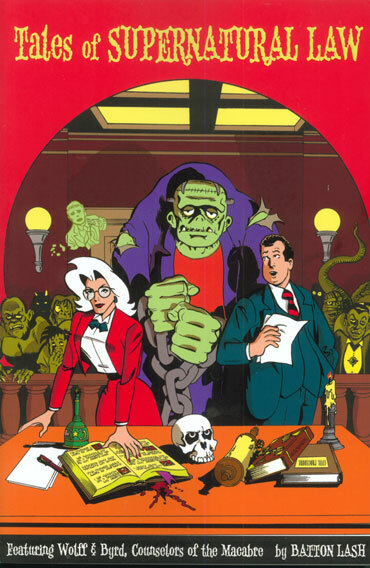 Yes, fiends, it's October, and because of that, yes, I've made an executive decision: it's gonna be a monstrous month here at Hembeck.com.! Rare art, nostalgic ramblings--maybe even a pun or two (ya think?...) --most all of it with a Halloweenish tinge! Come back, then, for a daily dose of tricky treats--if you dare! By all accounts, Hammer Studios' 1957 release, "The Curse Of Frankenstein", was a mostly successful updating of the classic Universal series from decades earlier. 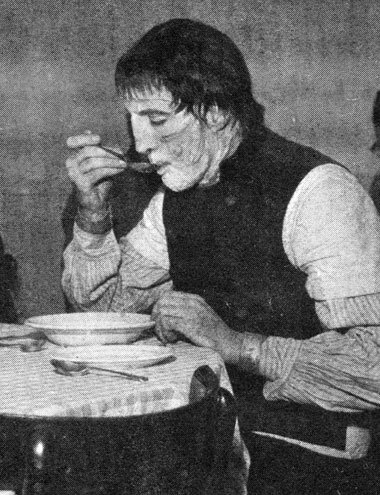 Film historians, on the whole, however, much preferred Boris Karloff's Monster declaring "Bread good! Fire bad!" to Chris Lee's perhaps too-subtle complaint, "Soup warm! Needs salt!" Nice wristwatch mad Doctor Rolex provided the creature though, don'tcha think?..